One of the most famous players to come through the ranks at Edgar Street before reaching the world stage was Kevin Sheedy. He was born in Builth Wells in Wales on 21 October 1959, but had an Irish father which made him eligible for both Wales and Eire. Kevin joined Hereford United as an apprentice and made his Football League debut for the club in April 1976, before signing professional terms. United went on to become Third Division Champions that season, but Sheedy had also been a part of the youth side, managed by Tony Ford, that lifted the Midland Intermediate Youth League. Alongside Sheedy in that squad were Chris Price, Brian Preece and Julian Marshall, who all went on to play first team football for the Bulls. Having made so great an impression in a creative left-sided midfield role he was handed his debut against Preston North End in the clubs final match of the season. Scenes of wild celebrations followed a classy debut for the 16-year-old as Hereford romped to a 3-1 victory with a hat-trick for Dixie McNeil. In the clubs one season in the Second Division Kevin made three substitute appearances against Fulham, Charlton Athletic and Nottingham Forest before being handed a spot in the starting line-up again. United drew 2-2 with Sheffield United with Steve Davey and Roy Carter bagging the goals for Hereford that day. Sheedy retained his place in the side for the rest of the season, making 13 full appearances. On the world stage, Sheedy chose Eire and was selected for their youth team in a friendly against Germany, before later winning Under-21 and full international caps. Sheedy scored his first goal for the club against Millwall at Edgar Street in a 3-1 win on 20 April 1977, with Dixie McNeil scoring a goal either side. Indeed many supporters felt it was a combination of his installation as a creator in midfield, reinforced by the return of Steve Emery at right back that made United competitive at last in the Second Division. The Bulls lost just three of the games in which they both started including victories over Oldham, Millwall, Blackburn and Southampton. Kevin made a total of 47 league appearances for Hereford United, scoring 4 goals but such was his talent he was transferred to Liverpool for an £80,000 fee in July 1978. However, he featured in only three league games for them in a four-year stay at Anfield. So, with first team opportunities limited at Liverpool he moved across Stanley Park to Everton in August 1982 for £100,000 where he made an immediate impact. He became recognised as one of the best players in the First Division, particularly noted for his ‘cultured left foot’. Everton were League Champions in 1984/85 and 1986/87, and were runners-up in between. They were additionally FA Cup winners in 1984 and runners-up in 1986 and 1989, and League Cup winners in 1984. During this period Kevin made 274 league appearances for Everton, scoring 67 times. 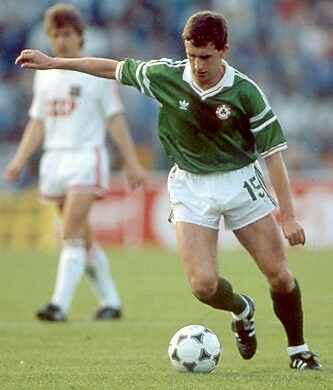 He also played in over 40 internationals after being first capped in 1983, and featured in many of the Republic of Ireland’s World Cup campaigns. His first full international appearance was as a substitute in a European Nations Cup match against Holland in Dublin. Ireland threw away a two-nil lead in front of their home crowd, and lost 3-2. The next month saw his first start against Malta in an 8-0 victory, including his first international goal. Lawrenson and Brady both bagged a brace, whilst the other strikes came from Stapleton, O’Callaghan and Daly. One of his favourite goals was the one he scored against England in the 1990 World Cup, the match ending in a 1-1 draw. Sheedy later moved to St James’ Park, home of Newcastle United, before moving to Blackpool, eventually chalking up over 400 Football League appearances. After retiring, Sheedy coached at Tranmere Rovers before becoming their assistant manager, and took up a similar role at Hartlepool, before joining Everton once again – this time as Under-18 Academy coach. In August 2012 he was diagnosed with bowel cancer but has since been given the ‘all clear’ after surgery, quickly returning to his development role at Goodison Park. A couple of seasons ago Sheedy took part in a Sportstalk Evening in the clubs Starlite Room, receiving this accolade from the former Hereford United manger and executive-director Colin Addison. He is currently working with junior players in Saudi Arabia at Al-Shabab. Was the sale of Kevin the most profitable sale HUFC ever made? If not which other players were more profitable (including sell on fees)?